I was so moved by the ceremonies for the passing of Senator Kennedy that I made a small book to remember both the occasions and the man. 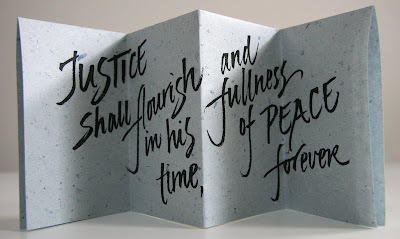 The inside of the accordion book (shown in photo) contains the line from Psalm 72 repeated in the Responsorial Psalm read by Kara Kennedy at the Funeral Mass at the Basilica of Our Lady of Perpetual Help in Roxbury, Massachusetts. Here's a pdf for you to print out on US Letter size paper and make a book of your own. To make the book, fold the paper in half the long way with the writing on the outside. Follow the written or video directions for folding an accordion book. When you make the first accordion fold, Justice shall ... should be on the outside. You can see a pdf of the Funeral Service program here. And here is my favorite photo in all the coverage by Frederick G.S. Clow, Special to the Gloucester Daily Times in Gloucester, MA.